While last week was marked by a surprisingly strong market despite several negative news events, it appears this week is turning out the opposite way. 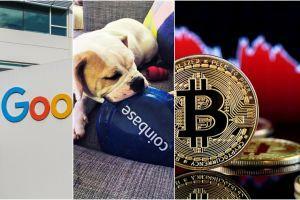 This time, two good news for crypto adoption, announced by Coinbase and Google was not enough to excite crypto traders, who continued to sell off holdings of bitcoin and major altcoins on Wednesday, which marked the fifth straight day of losses for bitcoin. 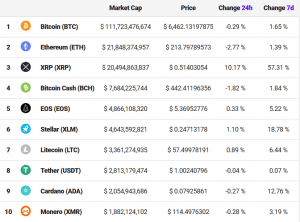 With the exception of Ripple’s XRP, which surged more than 10% in early Wednesday trading, most of all top 50 coins by market capitalization were in the red for the last 24 hours. In a statement published by Coinbase on Tuesday, the popular US-based fiat-to-crypto exchange announced a new listing process for new digital assets, while saying that their goal is to “rapidly list all assets” that meets their standards. The new statement marks a turnaround for Coinbase, which in the past has been hesitant to list new digital assets on its platform, and for a long time sticking with only bitcoin, ethereum, and litecoin as alternatives for their users to invest in. 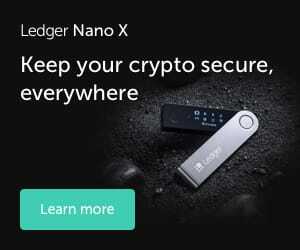 Now, however, it appears that the exchange has finally secured the regulatory assurances it needs to list more assets, even as their listing process becomes simplified. According to the exchange, this becomes possible by making some of the new assets available for users in a jurisdiction-by-jurisdiction manner, meaning users in different regions may not necessarily have access to the same assets. Also worth pointing out is that unlike other exchanges that may charge up to USD 1 million to list a new asset, Coinbase said their application process will be free of charge to begin with. In other news from Tuesday, Google said it has once again opened up for ads with crypto-related content in the US and Japan, after placing a ban earlier this year. This time, however, it is treading more carefully, allowing only certain regulated crypto exchanges to advertise using its tools. Google’s decision follows a similar move from Facebook in July this year, when it said that it will allow crypto-related ads from pre-approved companies. As reported on Monday, as the crypto market has become less sensitive to hype, and investors, speculators have largely held on to their positions over the summer, the bitcoin market will make a major move, for better or worse, only in response to a fundamental change, according to a new research from blockchain analysis company Chainalysis.